Small-scale gold miners are still out finding gold with metal detectors throughout Victoria. Gold has been recovered over a very large section of Victoria, with the most prolific producers located in the central western region— Bendigo-Ballarat-Stawell Districts; in the east— Walhalla-Wood’s Point Districts; and, in the northeast— Beechworth District. Each of these goldfields is particularly attributed to specific districts, which were practically based on geological and geographical features and characteristics. The following areas are where the major gold finds occurred in Victoria. These principal gold-bearing areas are found to the northwest of Melbourne, with the fields running generally towards a north-to-south trend. The rich area bordered by Ballarat, Wedderburn and Bendigo is recognized as the richest alluvial gold-bearing area in the world and is widely referred to as “The Golden Triangle”. 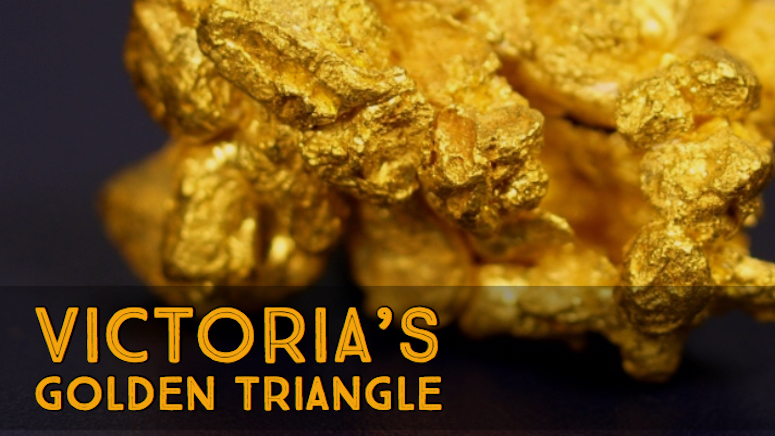 Victoria’s Golden Triangle region is word-famous for the large sizes, purity, and quantities of gold nuggets found within the area. It continues to yield significant finds even at the present times, and it is perhaps, one of the better known Victorian gold-bearing areas frequented by prospectors with modern gold metal detectors. The region, encompassing an area of 9,400 sq km, nestles on the northernmost portion of the Greater Central Goldfields region. The base line of the triangle begins at the township of Avoca marking the South West point, and then treads a line to Castlemaine City, which marks the South East point, and with both sides of the triangle meeting at the apex in Wedderburn Town to the north. The Welcome Stranger Nugget is the largest solid gold nugget found in on Earth. It was dug up near the town of Dunolly in Victoria, Australia back in 1869. 32 of the 40 largest gold nuggets found in Australia have been found in Central Victoria. Several of the nuggets were unearthed within a few inches of the surface. The shallow ground are generally worked out, but operations have given satisfactory results in the deeper alluvial. And metal detectors still find an occasional nugget of impressive size still today. These finds included the world’s largest recorded nugget, “The Welcome Stranger”, found just a few centimeters below the surface at Moliagul near Dunolly, in 1869. It had a total weight of 2,284 troy ounces. Another large nugget was the “Welcome” nugget, which was recovered in Sovereign Hill in 1858 near Ballarat, Victoria. It contained 2,217 troy ounces of gold. In addition, the “Hand of Faith” nugget was the largest gold nugget discovered with the use of a metal detector near Kingower in 1980. It was also the largest gold nugget still in its original form and weighed 875 ounces. Other notable nuggets were the “Viscount of Canterbury”, which weighed 1,121 troy ounces and found on the Berlin goldfield near Rehola. The “Kum Tow” with a weight 795 troy ounces was also found on the Berlin goldfield. At the Poseidon Lead near Tarnagulla, it produced “The Poseidon”, weighing 953 troy ounces, and Leila at 675 troy ounces. There have also been several other gold nuggets well in excess of 100 troy ounces recovered throughout the years at many of the goldfields within The Golden Triangle. In fact, a couple of its goldfields— Kangderaar Diggings at Kingower, and the diggings between McIntyre and Tarnagulla— were dubbed “Potato Diggings” since the nuggets found were as numerous, and similar in size, to potatoes. These old “Potato Diggings” have become a popular site for modern day prospectors since the advent of metal detectors as a prospecting tool. 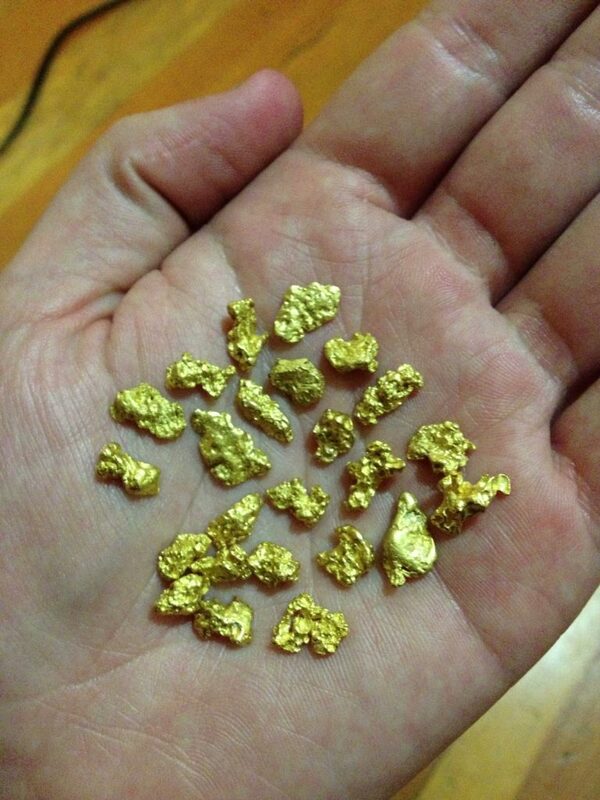 As a result, several gold nuggets at various sizes have been recovered in more recent times.